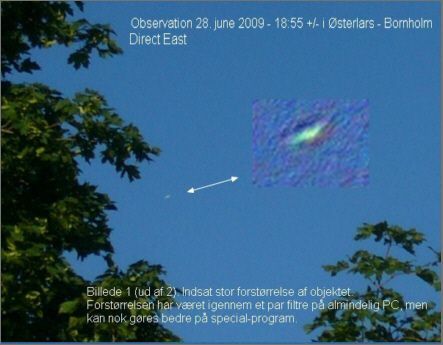 The witness observed a UFO in the skies over Oesterlars on bornholm in due east direction, Sunday 28th of June 2009 clock 6:55 pm. 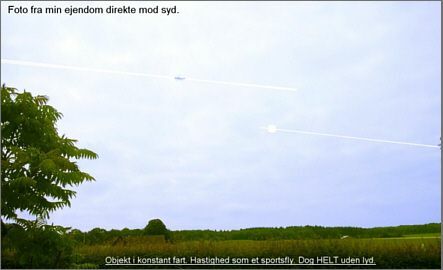 "The object had a constant speed, and the speed could have been as a light aircraft. But in this particular case, there was nothing to be heard, absolutely no sound. In a matter of a few seconds, the object did some bizarre leaps, and then continued with the same speed as before. However, I did not see the leap, because I was looking down on the grass to stay in balance. I have marked the object, and in my view it is the size and a white spot where object gave a white flash". Since my wife could not find the large camera, because it should go very fast, the picture is taken with another digital camera, a Panasonic DMC-LC50 Leica lens, and full zoom is used. There is not made any changes to this original photo. 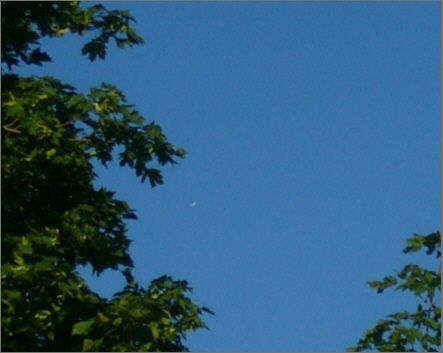 Reconstruction of my UFO observation. Photo taken from my farm, directly south. 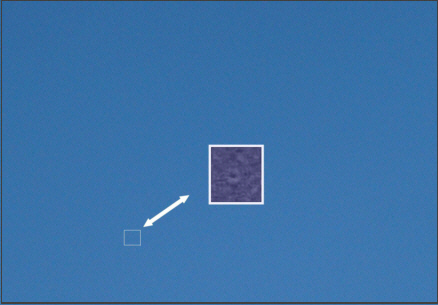 To the left a reconstruction of my UFO observation, in which I have included 2 white stripes which shows "the route" and the odd leaps, which the object carried out in just a few seconds - and then continued with the same speed"
Magnification of the object is inserted in the picture. Here, I have tried to enhance the object through a few filters on a general PC". Object inserted in the picture, where I have used various filters. 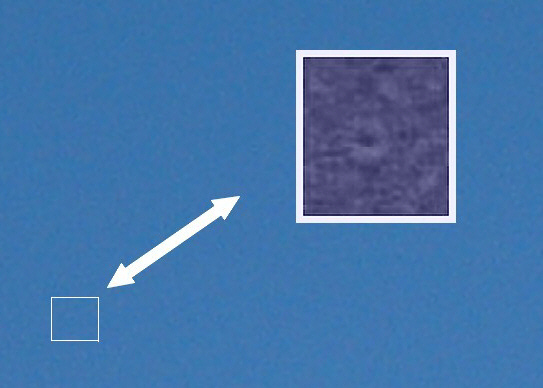 Here I have taken the "sample" where UFO disappeared, and enhanced it by using various filters. 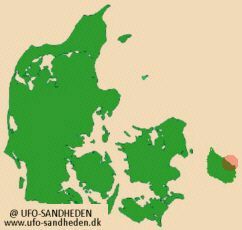 I have earlier seen something inexplicable in the sky southwest of Bornholm, but it is many years ago and only the position could be confirmed by a family member, who at that time lived on-the island, so that we - with the help of the angle, were able to calculate the position.